‘Tis The Season to Be Silly at BCT! Beaverton Civic Theatre’s 2013 season has taken its audiences on a wild ride from the sublime to the ridiculous. After the somberly enthralling production of The Crucible, this versatile troupe brings us If It’s Monday, This Must Be Christmas, a piece of holiday fluff that ends the year on a much lighter note. Author Pat Cook began his prolific career as a playwright after being inspired by Neil Simon. While Cook’s script is often clever, Mr. Simon can rest easy – Cook’s work is no challenge to such classic comedies as The Odd Couple and Plaza Suite. Happily, by late November theater audiences are sometimes less interested in great writing than in silly comedy, which Cook delivers with a vengeance. The story? Good heavens! The gift-wrapped payroll for Harrigan’s Department Store has disappeared, along with the store’s Santa Claus. Whodunit? Store employee Loretta Mondello calls in her son, private eye/dogwalker Harry Monday, whose bumbling detective style ultimately cracks the case (of the missing money – inexplicably, Santa never does turn up…). Along the way, mayhem ensues (two acts worth)! 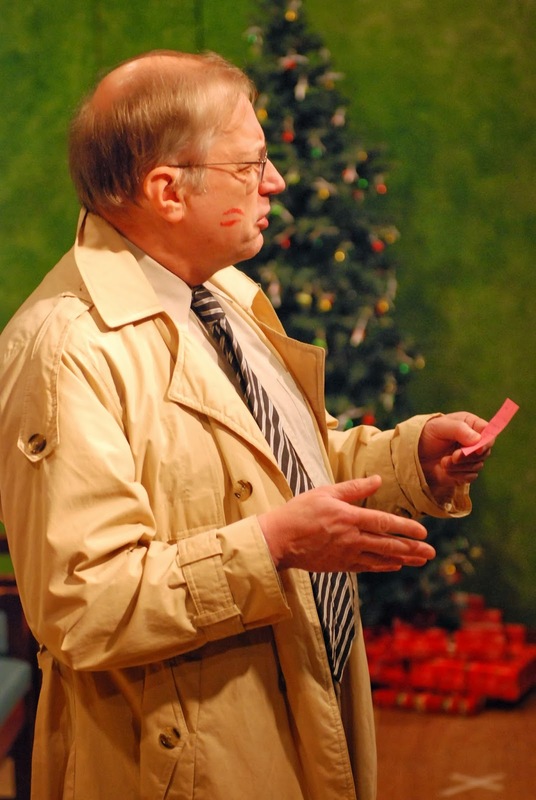 The “bumbling detective” (who is really quite shrewd) is a stock mystery character. However, Harry Monday, as portrayed by John Ollis, defies the stereotype – lots of bumble, not much shrewd. 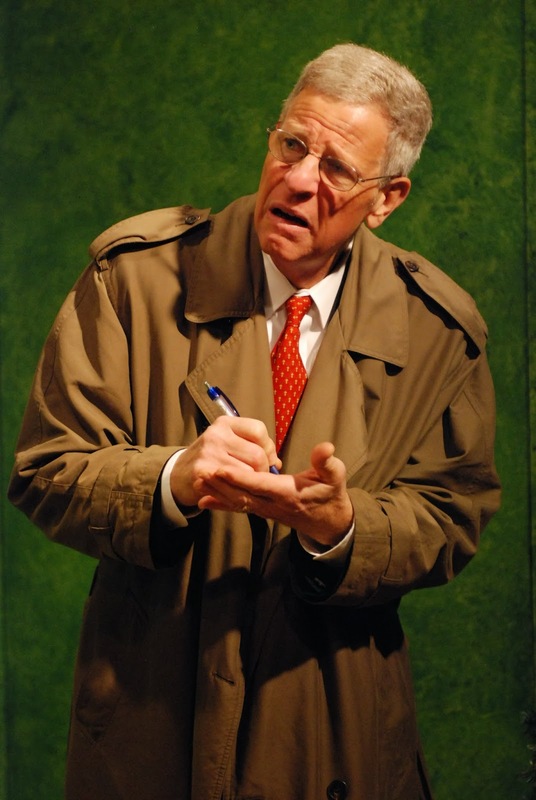 Ollis frequently breaks the “fourth wall”, addressing the audience in a friendly but conspiratorial tone that keeps us on track with the show’s convoluted plot. Allen Denison portrays Harry’s occasional sidekick, pickpocket Louie Grandville, with aplomb. Denison gives us the perfect con man: slightly shady but smooth and articulate. Rival department store owner Mildred Wolensky is portrayed by Helena Greathouse, whose Czech accent, combined with a pronounced declamatory style, creates a curiously compelling character. What passes for love interest in the show comes from the relationship between store employee Carson Page (Les Ico) and store owner’s daughter Penny Harrigan (Harmony Rutter). These two young actors deliver some of the most natural and believable moments in the play. The other two younger performers also bring their best games. Kassy Williams does a great job of portraying Polly Brogan, a nagging little brat in search of Santa, and Riley Edwards (Harry Monday as a child) shows so much moxie that one wonders how he grew into the bumbling adult version of the character. Patti Speight brings all the intensity of a ticking biological clock to the role of Scarlett Kloontz, and Patrick Brassell (store owner Titus Harrigan) is appropriately bombastic. Patricia Herkert creates a frenetically wide-eyed and perky elf who ranges from excitable to downright hysterical. Director George Herkert has assembled a fine production team. The set, while simple, is attractive and appropriate, and the costumes capture the spirit of the characters. The huge opening-night crowd proved a bit distracting – many audience members were seated in portable chairs along the aisle with less than optimal sight lines, and the show began more than ½ hour late. Perhaps the time has come for BCT to reconsider their admirable “donate two books, get in for $5.00” opening night promotion – maybe by selecting a slower evening (or matinee) for this attractive deal. Beaverton Civic Theatre’s production of If It’s Monday, This Must Be Christmas runs through Sunday, December 8th at the Beaverton City Library Auditorium, with 8:00 pm shows on Friday and Saturday and 2:00 pm matiness on Sunday. Frau Beethoven, played by Helena Greathouse, wields two blades during the play "Murder at the Orient Express," at the Beaverton City Library. Two men meet at a Chinese restaurant, a wealthy millionaire and a private detective. The millionaire is worried that someone is trying to kill him. Suddenly the lights go out, there’s a scream, and the scene is set for another classic who-dunnit. That’s the plot of Beaverton Neighborhood Association Committee’s latest summer theater production, currently playing at the Beaverton library. The plot is based on the classic Agatha Christie tale “Murder on the Orient Express,” but with a bit of a twist. “This is ‘Murder at the Orient Express,’ and the Orient Express is the name of a Chinese restaurant,” said Helena Greathouse through a thick Czech accent. Greathouse stars in the production as an eccentric waitress named Frau Beethoven, a rigid German woman who is not at all upset that the mysterious millionaire has just been murdered. But don’t think that gives away the plot. As anyone familiar with Christie’s original novel will tell you, everyone on the Orient Express is hiding something. “I don’t want to give it away, but she’s around all the time, and it comes to her in the last act,” Greathouse said. The NAC summer program is a newer program put on by members of the Beaverton Civic Theatre, now in its second year. The productions usually bring in actors who aren’t as experienced, Roder said, and that’s part of the fun of the production. Greathouse acted in NAC’s summer production last year and has already become a part of the summer theater family, Roder said. That basis in movement comes from Greathouse’s career as a competitive gymnast, which she did until the 1970s, when she made the transition from performer to judge. Greathouse was an international judge in rhythmic gymnastics for almost 30 years before moving to her home in Tigard’s Summerfield community in 2002. Greathouse judged at two Olympic Games – Los Angeles in 1984 and Atlanta, Ga., in 1996 – and says that the art of movement is pivotal for her and her acting. Greathouse’s was perfect for the character of Frau, Roder said. Despite what could be a serious subject matter, “Murder at the Orient Express” is a comedy for the whole family, Roder said. “Murder at the Orient Express” plays at the Beaverton City Library, 12375 S.W. Fifth St., for two more shows: Today (Thursday) at 7 p.m., and Saturday, July 24, at 2 p.m.
For more information about the show, contact the library at 503-644-2197. OTO's new opera cabaret group, the Cavalcade of Beautiful Losers, continues its first show, "Will Kill For Vaudeville," March 29 and April 10 at the Someday Lounge (8:00 pm, tickets $10 at the door). The evening, dedicated to the slightly shabby grandeur of end-era vaudeville, includes performances by Coney Island Cartel and Czech cabaret artiste Helena Greathouse. The Cavalcade is a new OTO project to produce opera at bar venues, sharing a bill with local bands and performance artists. The shows, written by Artistic Director Katie Taylor and arranged by Maestro Camelia Nine, include music from opera, vaudeville, cabaret and modern throwbacks, like Tom Waits and AC/DC. "Will Kill For Vaudeville" runs once monthly, February through April, with guest artists. The group's second show, "The Carnie's Confession," a Dust Bowl opera melodrama, opens in May and runs monthly through July. ABOUT "WILL KILL FOR VAUDEVILLE"
"Will Kill" is a dark comic elegy for vaudeville, filtered through the demented perspective of aging former child star Ethel Million (soprano Elizabeth D. Bacon). The show includes music by forgotten vaudeville greats like Victor Herbert, A. Baldwin Sloane and Albert von Tilzer, soaring arias and ensembles from French lyric opera, and a bit of AC/DC, for flavoring. Squish and the Flat Sharp Saw, with Coney Island Cartel '20s and '30s retro jazz, ragtime and swing band, fronted by musical saw and ukulele player, Squish. From Czechoslovak National Television: Cabaret Artiste Helena Greathouse, backed by accordionist Mark Greathouse. You haven't heard 'Mack the Knife' until you've heard it in Czech. Madame Régine Brosse-à-dents, 8 Ball Prognosticator The act that, quite rightly, only sees the backs of the audience's heads as they leave. Small and alternative, Opera Theater Oregon delivers showy, entertaining performances of opera in English, as well as original musical and cabaret productions. Our goal is to produce innovative and accessible shows, preserving the beauty of the music while playing shamelessly with format, and offering affordable ticket prices. We're also committed to using local talent and non-traditional orchestration. WILL KILL FOR VAUDEVILLE 60-year-old "Baby" Ethel Million's triumphant return to Orpheum Circuit. OTO Cavalcade of Beautiful Losers, various venues and guest artists. THE CARNIE'S CONFESSION A Dust Bowl Opera Melodrama. OTO Cavalcade of Beautiful Losers, various venues and guest artists. 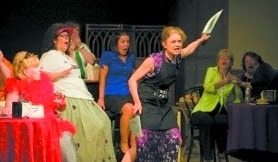 For more information, visit www.operatheateroregon.com, or contact Artistic Director Katie Taylor, operatheateroregon@yahoo.com or 503.234.4515. THEIR LIPS AREN'T SEALED The shabby, dusty era of vaudeville meets highbrow French lyric opera in the Saturday, Feb. 10, debut showing of Opera Theater Oregon 's new "opera cabaret troupe," the New Bellini Cavalcade of Beautiful Losers . According to OTO artistic honcho Katie Taylor, this PG-13 scripted revuesical (at the Someday Lounge) includes a slate of guest stars, including Helena Greathouse , a former darling of Czech National TV who performs in Liza Minnelli-inspired spangleswith her husband on the accordion. The Cuban missile crisis took the world dangerously close to a nuclear disaster. Robert McNamara ironically called the politician’s responsible - rational men. The rational men were Khrushchev, Kennedy and Castro. Each became victims of a game of chicken that threatened the annihilation of all nations. A Google search can give you the basics of the thirteen days of terror in October 1962. Those who were old enough to remember can tell you what they were doing when Kennedy’s televised speech shocked the country into fears of World War III. It wasn’t until an international conference in Cuba in 2002 that the world understood how close we came to a nuclear holocasut. type reads "Fidel Castro overthrows brutal dictator to liberate Cuba. ….Castro dumps on capitalist ideology…. CIA attempt assassinations with with LCD laced cigars…." Below these headlines Mouawad stages a cantankerous celebration that turns sour then deadly. The action is both literal and abstract. Mouawad says, "I’m into my third week of rehearsal and we open in three weeks, so everything is as crazy as the crisis. I’m trying to piece together two different events to become one. The historical data on one side of my brain, and the events of this strange party at the other. It’s tricky and complex,however what I’m after is simplicity." Not unlike Apis, Mouawad will design lights and set and incorporate the design elements into his second of what he is considering a canon of movement plays without words.
" 1961, American Nuclear War Head: 6,312; Soviet Nuclear War heads: 401"What does Mouawad do with this data? He serves the Kennedys a horde of hors D’oeuvre, while across the room Khrushchev’s clan is served very small portions. We asked the director one more question: And is there tango? His response: "Ah, yes, with guns in hand."